Looking across the Great Lawn. The crane (with the ’merican flag) is part of the construction equipment for the new, controversial parking deck for the ABG, oh, and Piedmont Park. We had a mission: to photograph the kinetic sculptures at the Bot Garden. Given that it’s late June, we figured that we’d best arrive early. They open at nine; we were there before ten after. The sky was a bit overcast, and the temps were extremely temperate, until almost the end of the visit, when the garden became sunny, humid, and well-populated. 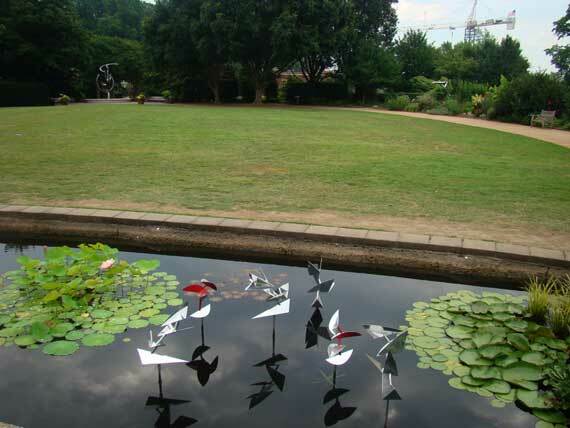 So, the Atlanta Botanical Garden, like many similar facilities, uses artwork to up the attendance (and revenue, etc.). The current display is “Sculpture in Motion: Art Choreographed by Nature” aka Art that Moves You. The “we” part: this was instigated (and funded) by my friend T., whom some of you know as E., and a few others as Dr. H. She wanted digital pictures of the exhibit to show to a friend who makes garden sculptures, maybe not as big and elaborate as these, but still, something similar (as I understand it; I’m just the photographer!). The sculptures are scattered throughout the garden, and this is the numbering system used in the program. Click on each for pictures and commentary. There are some obvious errors in the program’s map and the artwork locations, so this is my best guess at a matchup. We spent all morning touring the garden, such fun! Filled up the memory stick in the camera, even! To make sure your tour (of our tour) doesn’t clog your pipe, I’ve only included a few pictures on each page linked to above.